Herman Ridder Junior High School in the Bronx was being renovated when I visited as part of the the 8th World Congress on Art Deco in 2005 so I had to be a bit creative to avoid the hoardings and scaffolding. This photo shows the top of the multi-stepped tower including the Mayan style decorative friezes around the circular crown, the panels above the windows and the large urns on top of the square columns. Notice also the subtle use of colour in the small marbled pink panels. 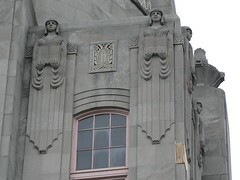 One of the main features of the tower are the stylised figures flanking the windows. I presume they represent students as they could be wearing school robes and seem to be holding open books. 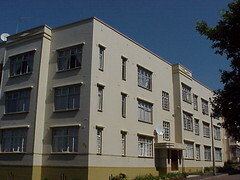 The school was designed by Walter C Martin and dates from 1929-31. 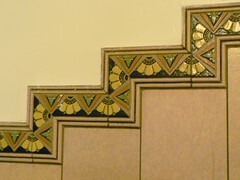 I remember there were some deco features inside the school building but the tiles on walls at the stairways really stood out for me. 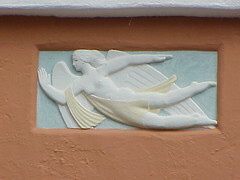 I don't think anyone would describe Angel Cottage in Portmeirion as Art Deco and I am certainly not going to try. Portmeirion, however, is a very interesting place. Sir Clough Williams-Ellis purchased the site in the mid-1920s and proceeded to build his concept of a coastal village over the following fifty years. 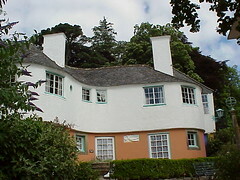 Angel Cottage was the first new building built by Williams-Ellis in 1926. My favourite part of the building is the Angel relief. In the 1960s, Portmeirion was used as the set for the cult TV series The Prisoner. A modern reinterpretation Series 2, sadly not filmed in Portmeirion, is due to be screened in Britain during 2009. 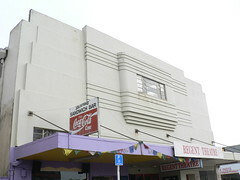 In the mid 1930s New Zealand town of Hokitika needed a new theatre. The Princess Theatre had been built in the 1880s and was by then in very poor condition. The Christchurch architect W Melville Lawry designed a new theatre and local builder E H Shirley won the tender to construct the building. The Regent Theatre was completed in December 1935. Two weeks ago it hosted the Hokitika community Christmas Carol evening. Today the theatre is a Listed Building with a Conservation Plan developed by specilist Conservation Architect, Ian Bowman. In recent years, a Members Society has been actively chasing 400 members, to match the number of seats in the theatre. This is a great building in Franklin Street, Adelaide. I photographed it in 2005 and I hope it is still there because I didn't get to this part of town the last time I was in Adelaide. 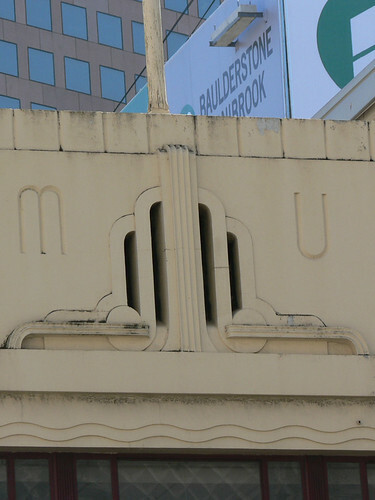 I call it the M U Building because it has this wonderful deco motif on the facade featuring the initials M & U. 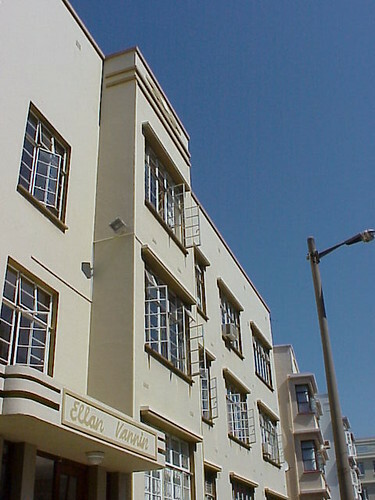 This large block of flats in Durban is called Ellan Vannin. From the above angle you can notice the curved end to the canopy over the doorway. Otherwise, the minimal decoration on the building consisted almost exclusively of straight lines. 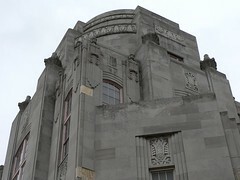 The other exception is the diamond motifs at the roofline of the projecting sections of the facade. The windows are interesting. I suspect that at one time they were all metal frames with small square panes but over time some have been replaced with larger panes. 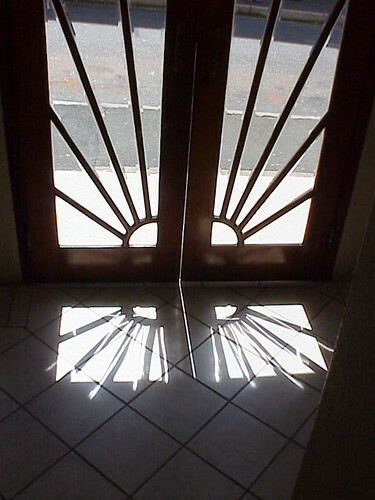 The main doors by contrast are wooden with this fantastic sunburst design. I love the glimpse of this house in Miami over the hedge. 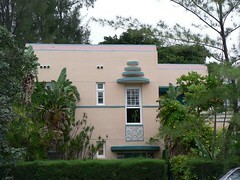 Naturally it is painted in pastel pink with the deco details picked out in green. The arrangement of 5 circular discs, one serving as a porch above the main door with another four above the window provide a very striking feature. Each disc is smaller than it's predecessor as they progress up the facade. The panel directly below the window is fantastic and someone with more patience than me painted it. 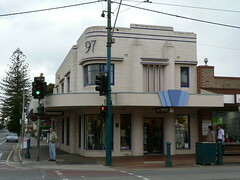 The town of Beverley, Western Australia, about 130km from Perth, has a couple of great art deco buildings. 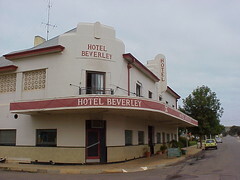 This is the Hotel Beverley, originally a Victorian pub that was made-over in the 1930s. 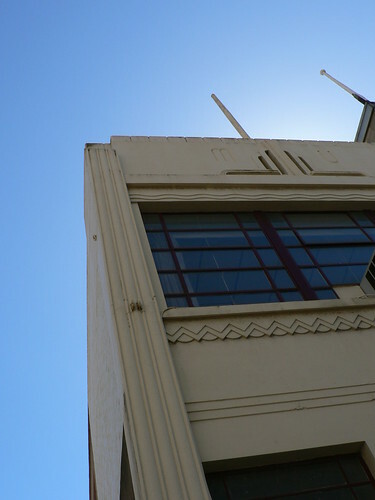 You can see it has a corrugated iron roof, like a lot of Australian country pubs, but also has the concrete deco elements punching through the roofline. During the First World War, Arthur Pearson, owner and founder of the English newspaper, The Daily Express identified the need for a training centre for blinded soldiers returning from the front. Pearson had been blinded himself through glaucoma, was the first Presidnet and Treasurer for the National Institute for the Blind. By March 1915 there were sixteen blind servicemen enrolled in a revolutionary training programme to help them return to as normal as life as possible and earn a living. They were housed in the residence of the American banker Otto Kahn called St Dunstan's Lodge which Kahn loaned to them for the duration of the War. These sailors and soldiers became known as St Dunstaners. Several convalescent homes were established in the south of England including West House at Kemp Town, Brighton. 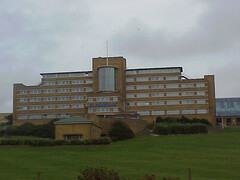 By the mid-1930s, West House was full so land was purchased nearby at Ovingdean. 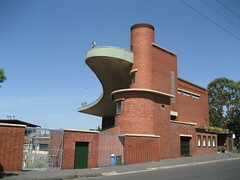 Francis Lorne designed this magnificent building in the shape of an aeroplane. 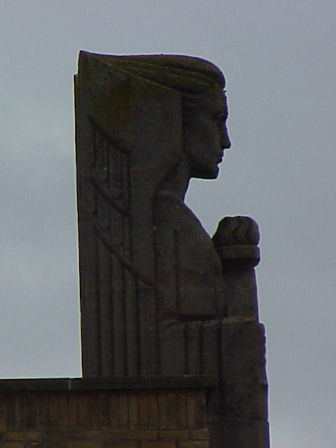 It was completed in 1938. The front bears this sculpture holding a shield with St Dunstan's across the front. An interesting block of flats in the Melbourne suburb of Albert Park. Conventional, two-storey with a ptched roof on the left and streamline and minimal on the right. A simple low wall and a neatly trimmed hedge show off the building very nicely. These are the fantastic entrance gates to St Augustine's Mansions in the Berea district of Durban. 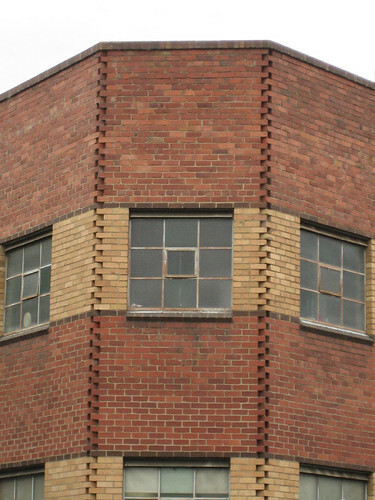 Starting at the top, there is a band of chevrons running just below the guttering. 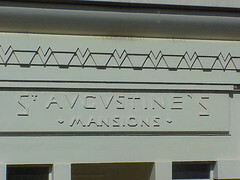 Directly above the gateway, the name of the mansions is inscribed in suitably stylised lettering. 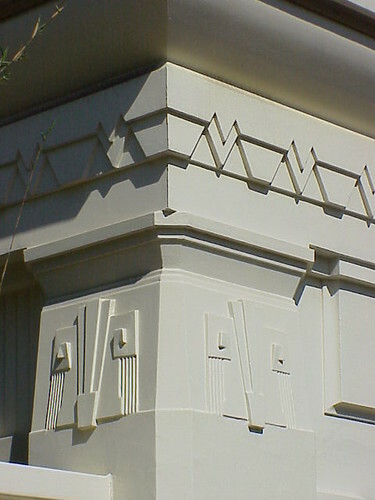 On the faces of the columns are mask-like geometric decorations which are also perhaps Mayan inspired. The gateway is flanked on each side by tapering walls bearing light fixtures. These look modern by fit in nicely with the other decorative features. The best thing about crusing around the city on my pushbike is that it is easy to explore streets and dead-ends that you don't normally get to in the car. 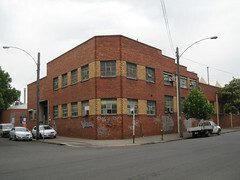 I found this factory or warehouse beside a railway line in North Melbourne. The use of the contrasting colours in the layers of bricks drew my attention but I really liked the way the bricks interlock on the corners. The NGV Melbourne Winter Masterpieces Exhibition: Art Deco 1910 - 1939 may have finished but the audio guides have just been posted on the NGV website (www.ngv.vic.gov.au). 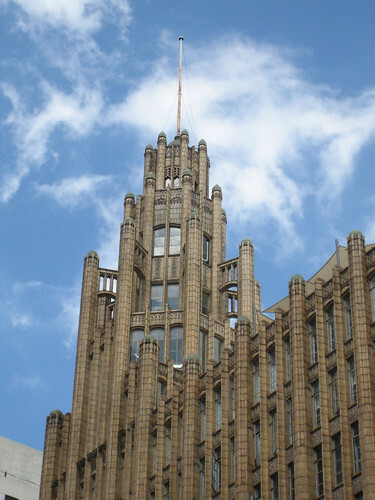 If you scroll right down to the bottom of the list of Art Deco podcasts, you'll find a section on Australian Architecture and they used my picture of the Manchester Unity building on the corner of Swanston and Collins Sts to illustrate this section. 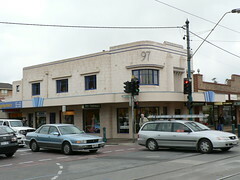 This fantastic corner shop is in Jetty Road, Glenelg. 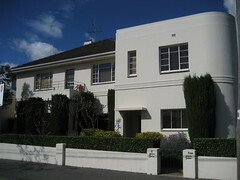 It is probably two buildings but the colour scheme and the deco motifs on the verandah face bring them together to great effect. I love the corner. The window is cut into the curved face of the wall with a shallow eyebrow above it. The number certainly adds style and you wouldn't have any difficulty finding No 97. Front on, the shop takes on an Egyptian feel with the two round columns flankng the doorway and continuing through verandah to the second storey. It is the decoartive element between the columns on this level which seems Egyptian to me. This view also shows how the dark blue (which also reminds me of Egypt) has been used to highlight the decorative elements and tie the parts of the building together. This fantastic house in in Cape Town or nearby, perhaps down the Cape. 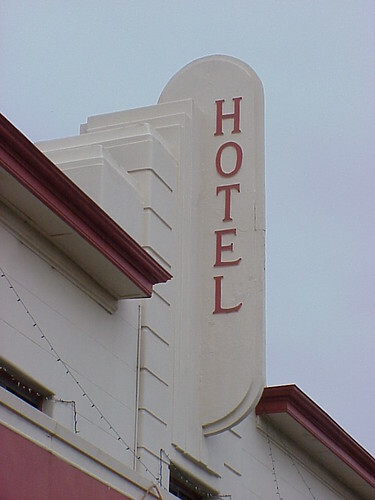 Great rounded end with stepped skyline. The stepped wall is also a nice touch. 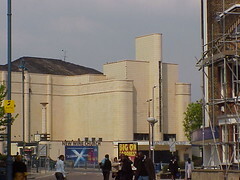 This is the amazing former Odeon cinema in Woolwich, South London. 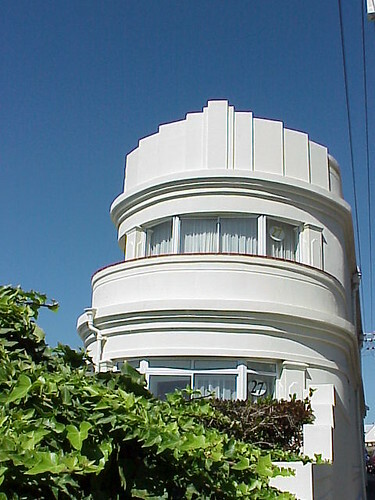 It was designed in the late 1930s by George Coles. It no longers operates as a cinema and is occupied by the New Wine Church. 55 Broadway is the amazing headquarters of the London Underground. It was designed by Charles Holden in the late 1920s. Holden also designed many of the iconic art deco style tube stations around London. 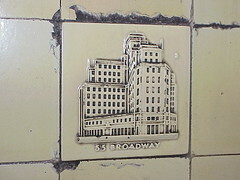 I snapped this picture of a tile on the wall of a tube station and I reckon it is the best picture I am going to get of 55 Broadway. This is possibly my favourite grandstand any where in the world. It has nothing to do with Aussie Rules football, which I adore, or any sport because I have never seen a match here and I don't think I've even set foot in the stand itself let alone taken a seat. Current AFL team Hawthorn played here until 1973 and continued to use it as their training base until they moved to Waverley a few years ago. The stand is named after the Hawks legendry player Michael Tuck who played a league record 426 games, all for the club in a career spanning 1972-91. Naturally, Tuck was selected in the Hawthorn Team of the Century and the painting commissioned to commemorate the selection of that team shows the grandstand in the backgound. 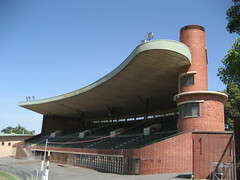 The stand was designed in 1938 by Stuart Calder and has been listed by the National Trust. The streamline design is spectacular. The circular tower at one end contrast with the somewhat blunted cut-off look at the other. I have heard there may have been plans for a matching tower at both ends but I haven't seen any proof that it was planned that way. In my opinion there isn't a view that is not beautiful. Maybe if I had stood in the outer, shoehorned between the railway line and the boundary fence in the mid-winter rain watching St Kilda get done I might have a different view on the subject. But all my Hawthorn inflicted misery has been at other footy grounds so I get to visit Glenferrie and appreciate it for it's beauty. Out at their new hi-tech training base at Waverley, Hawthorn have established the Hawks Museum. I was out there on Monday and was thrilled to see the door to the museum office. 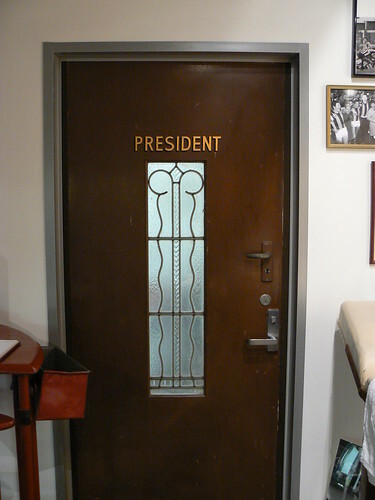 It was the old door to the President's Office at Glenferrie. Peter Haby, Club Historian and Museum Curator, told me that the door had been removed during a renovation of the offices at Glenferrie Oval in the early 1990s. Head trainer and former player Andy Angwin had salvaged the door and kept it in a storeroom until he could pass it onto the museum. I'm glad he did. It's a beauty. 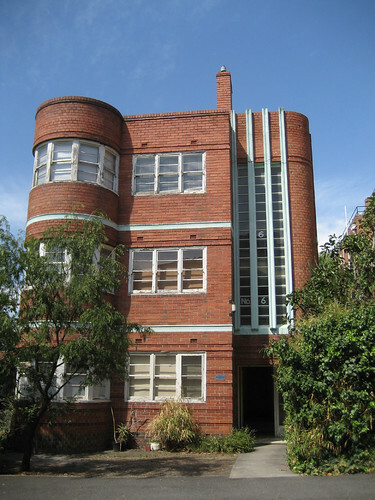 Garden Avenue in East Melbourne is a small enclave of Art Deco blocks of flats. No. 6 combines horizontal elements in the windows of each flat including the circular rooms to the left. There are also horizontal lines between each floor and also in subtle use of bricks on the ground floor and above the windows. 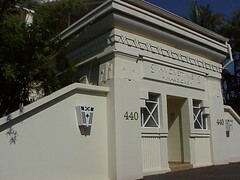 On the face of the stairwell on the right, the emphasis is on the vertical with four columns leading from above the entrance to the roofline. The building is completed on the right hand side by with a curved corner, softening the edge of the building.